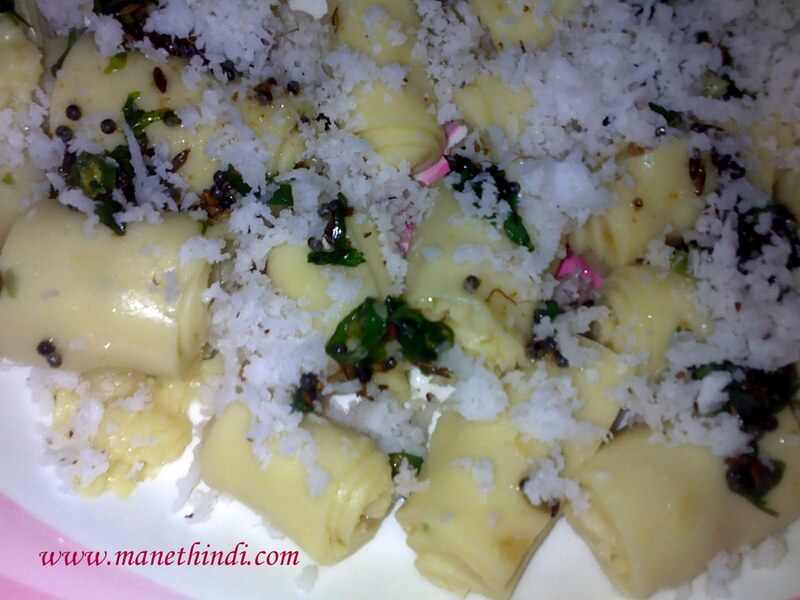 Khandvi is a Gujrathi delicacy. Its a healthy snack as it involves very less usage of oil and yet is very filling as its made of Chickpea flour or besan. Its a snack which needs a bit of practice to get the consistency right and also quick hands to spread n' roll the ready mixture when its done. Since its not very spicy kids love them as well! Goes well as a tea snack. In a large bowl, sieve the flour, soda, salt. To this, add turmeric, green chilli - ginger paste and the liquid ingredients..i.e., Curds and water or buttermilk. Using a whisk mix well so that no lumps are formed. This is very vital for the final result to come out well. Once the watery consistency batter is ready, transfer it to a thick bottom pan/wok. The wok should be on low-med flame and have to be constantly stirring the mixture. If not, this can also form lumps which will spoil the dish. So keep stirring. One can notice the batter which was watery will start becoming thick and also gets a sheen as we keep stirring it. Meanwhile, take a few large sized plates and grease them on the back with little ghee or clarified butter. To check if the batter is ready to be poured, test it. Take very little ready batter and spread it on the plate. Let it cool. Once cool the spread will be able to roll easily. If its not, then the batter has to be on the flame for some more time and the stirring has to be done constantly. Approximately, in 15-20mins the batter will be done. Pour the hot batter on the greased plates just enough to spread a thin layer across and let it cool. Once cooled, start rolling it tightly and cut them as per your requirement. Thin or Thick rolls. Put all the rolls on a serving plate. For the seasoning, heat 1-2tsp oil and add musturd seeds. When it crackles, add finely chopped curry leaves, sesame seeds[optional] and a pinch of hing. pour this over the rolls. 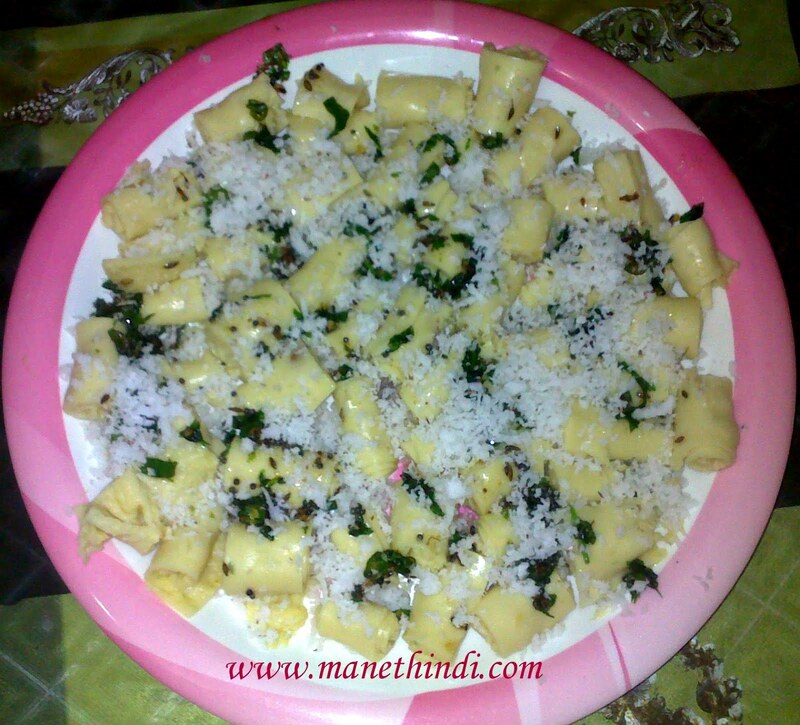 decorate with desiccated fresh coconut and finely chopped coriander leaves. Serve with tea/coffee as a snack or just by itself!